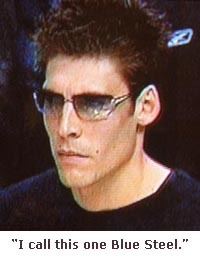 Sitting out Tuesday night's game after breaking three of his vertebrae in the previous game, Wally Szczerbiak looked like Derek Zoolander, wearing designer shades indoors. Charles Barkley the broadcaster is a hoot. After the game ended, he fired some of his usual priceless commentary. After the Nuggets failed to tie the game, Latrell Sprewell turned and started shouting at the Nuggets' bench, causing Jon Barry to go face to face with him to drop a dozen or so f-bombs. Charles: "Aww, why he got to go shoutin' at the bench. And who's that jackass with him [talking about some guy walking with Sprewell]?" Some fans threw cups and drinks at Sprewell as he walked off the court. Charles: "See, that's my pet peeve. You should be able to go after one fan in the stands each game and beat the crap out of him." Jayson Williams was quite the comedian as well, but his current situation is no laughing matter. That leaves Charles as the clown prince of the NBA.